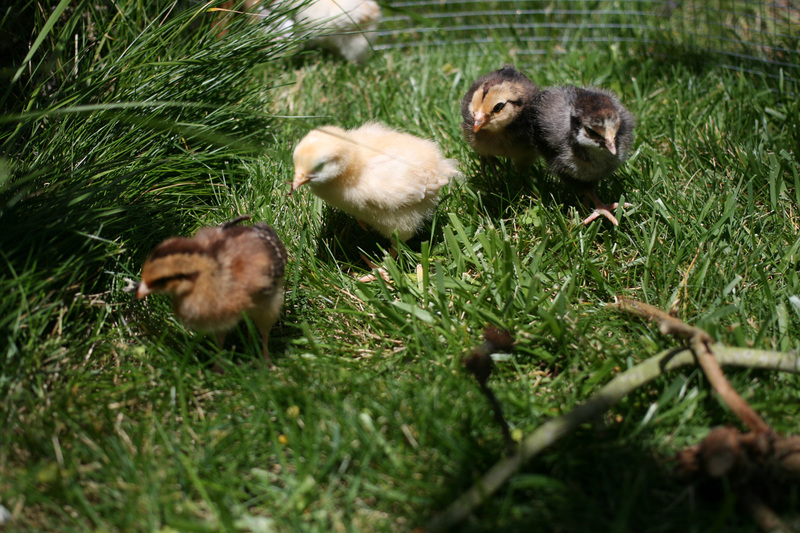 The weather was so lovely here over the weekend, we decided to take the chickies out on a field trip to the backyard! 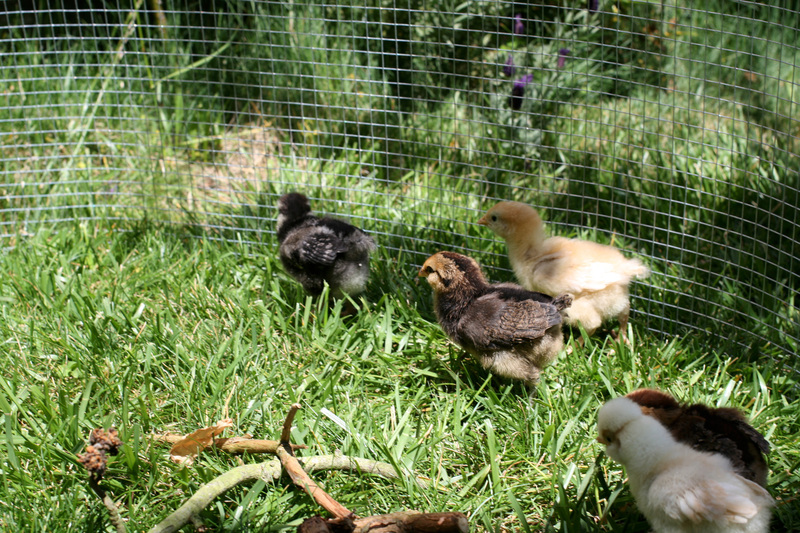 The yard is far too big and birdies far too small to be unconfined, so we built them a small temporary pen out of wooden stakes and leftover hardware cloth. 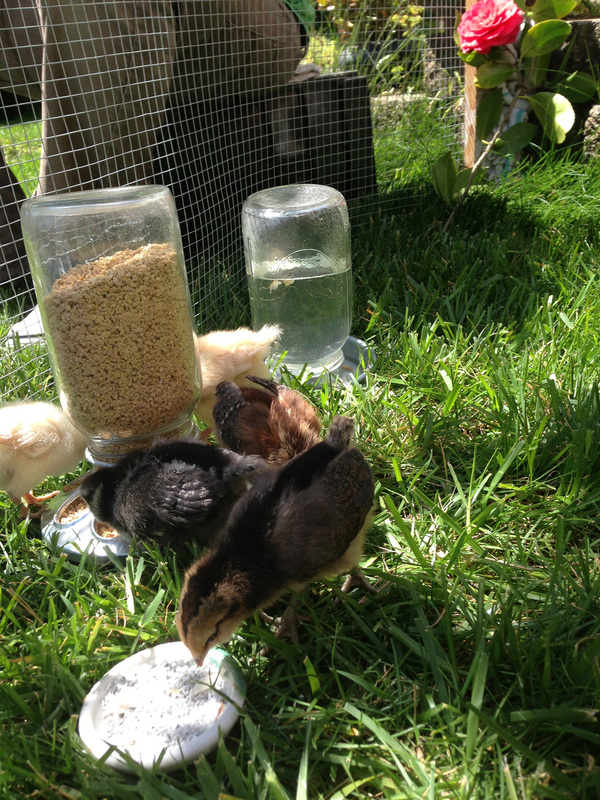 It was warm enough that we left the brooding lamp inside, but we brought out their familiar feeder and waterer, and a few small sticks to play on. The grass and bugs certainly kept them occupied well enough, though. The Wyandotte takes the trophy for first bug caught in the wild – a tiny moth, which caused quite a stir and chase. I think she got to eat the spoils. Tall grass is a little difficult to scratch in at this age. But oh the bugs and bits of bark are exciting. 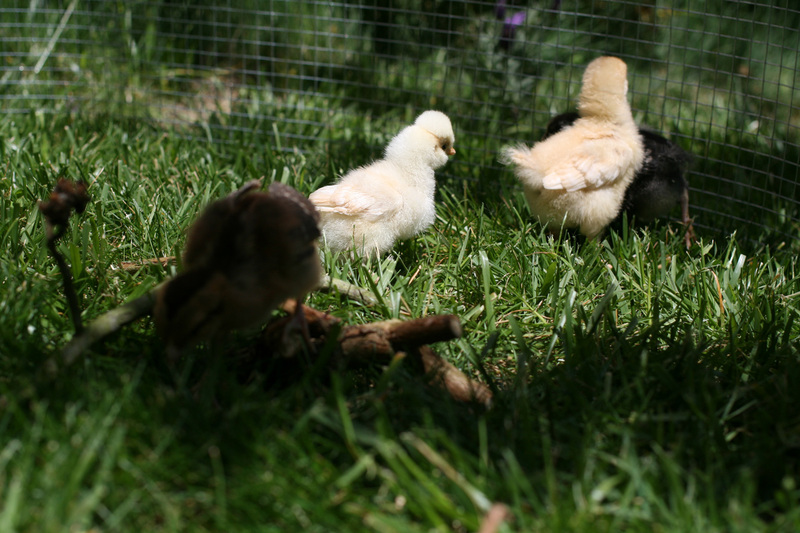 Fantastical new environs aside, it was a big day for the girls since up to now they’ve only been eating their medicated feed and some scrambled egg treats (not cannibalism!). 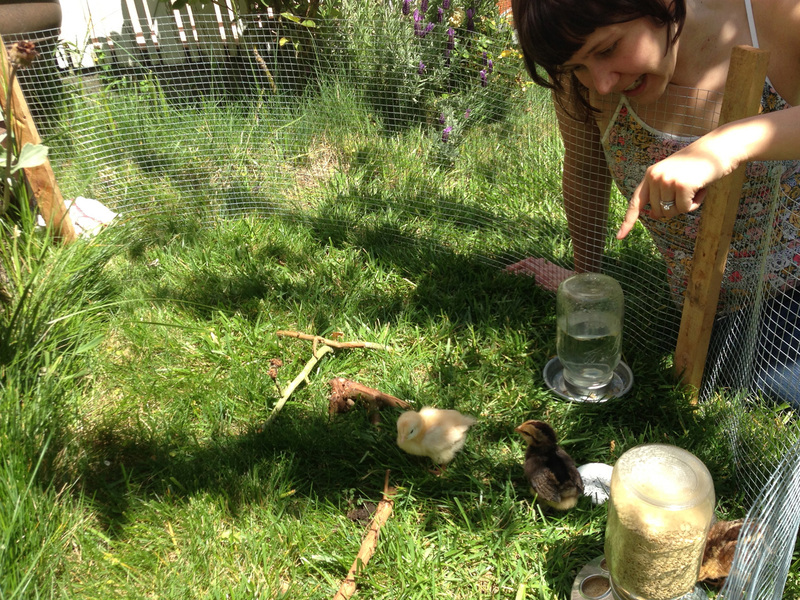 Introducing them into the (highly controlled) wild meant providing them with some chick grit. 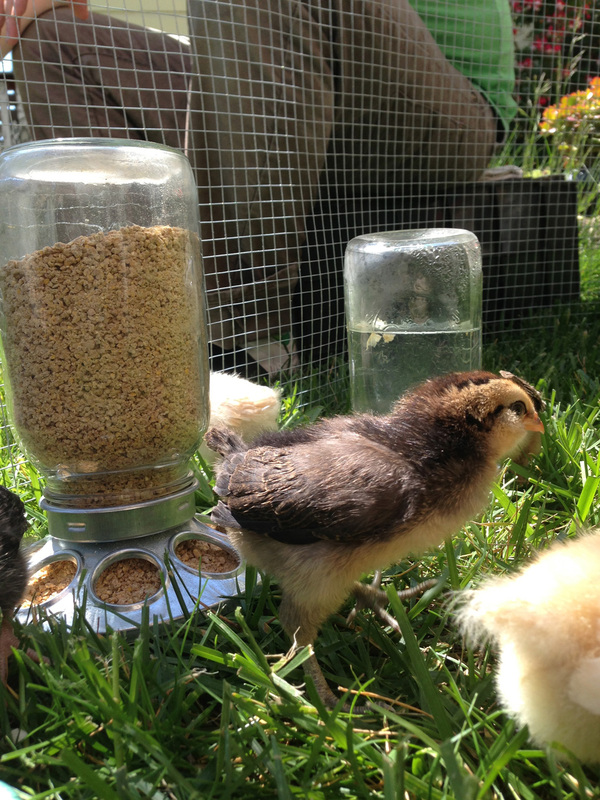 Grit (pictured in the small white bowl in the foreground, above) is basically just small stones that chickens swallow whole to help them digest. Heard of the gizzard? That’s where the stones are stored, and the gizzard + stones act just like teeth, which chickens of course don’t have. When a chicken eats anything that’s fibrous, it ends up in the muscular gizzard, where the stones grind together, breaking down the food until it can pass through the rest of the digestive system. Up to now we’ve always welcomed and celebrated the diversity of wildlife in the backyard, but this time it had us looking over our shoulders. 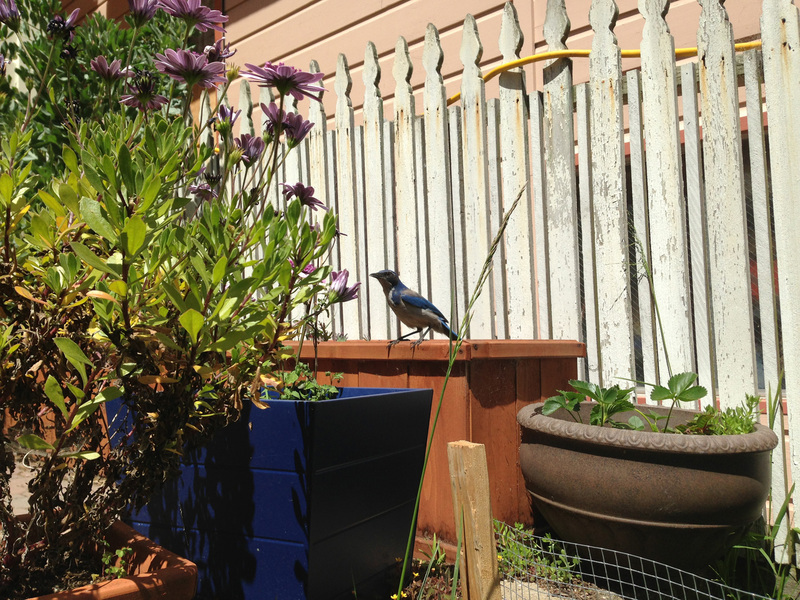 Blue Jays are naturally pretty clever, and the neighborhood regulars are particularly savvy at scavenging their urban environment—but I’d never seen one get that close before. It wasn’t totally clear at first whether this guy was interested in the feed or the chicks themselves, but a quick search revealed that jays and other types of crows are in fact known to attack and/or carry off small chicks. Whatever he was after, he was persistent, circling back every 10 minutes and landing in the plum tree right overhead a couple of times. Clearly our fuzzballs are going to need constant supervision for a while longer.